The framework for the tool that I will develop fits like a puzzle piece in a bigger system that is being developed in the research group “Social Learning” at Graz University of Technology. Selver Softic from Infonova GmbH and Ebner et al. from Social Learning recently wrote a paper about their ongoing research efforts aiming at knowledge discovery. They are aiming to provide a scientific architecture paradigm for building semantic applications that rely on social data. At the moment they are focussing on data from Twitter, like me. For this purpose they have implemented a tool Grabeteer for storing and caching social data. In this paper they outlined the architecture for a system that can extract, structure and link the data grabbed from Twitter by the Grabeteer. In the first section Softic et al. discussed the relevance and use of such a system. They motivated by referring to the fact that research has shown that twitter induced a new culture of communication. The main content spread through twitter are either daily chats, conversations, the sharing of information or the discovery of news. The usage of Twitter has proven to help to increase reports, statements and announcement during conferences. 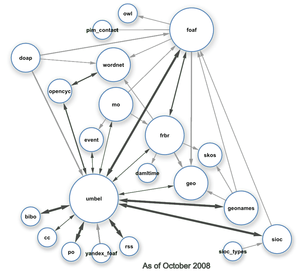 The authors the describe some of the research efforts that have been done to add semantics to twitter message streams. Since the communicational patterns of most tweets are very simple, they can be easily mapped into a tripartite structure. The next section describes the architecture of the system. There are three main layers in the system: Acquisition, Extraction and Analysis. The acquisition is being realized by the Grabeteer and can be accessed by an API. Softic et al. referred therefore to the Grabeteer API which is available at http://grabeteer.tugraz.at/. The data extraction layer consists out of a triplification module, a RDF storage and a module that interlinks the content to the “LOD Cloud”. Currently the authors have only a basic implementation of the triplification and interlinking module. One of my tasks will be to extend this module so that it supports the framework and the services needed for the development of the semantic profiling tool. The analysis layer will involve the exposure of the triplified raw data using SPARQL endpoints or lookup services. This will offer a solid base for further exploration of the grabbed data. The authors have developed a demonstration infrastructure called STAT: Semantic Tweeter Analysis Tool. The scientific profiling tool will be an application that fits in this layer. Softic et al. introduced the interesting aspects about microblogs, how far they correspond with ideas from other research areas like Semantic Web or Linked Data. They also tried to answer how far those two areas can be combined to gain more knowledge and mine usable data out of social context of microblogs. Finally they presented an architectural paradigm approach that delivers the answer to specified research issue.